For hundreds of years, physicists have hypothesized that the Universe should contain black holes. If enough matter is gathered into a small enough volume of space, the gravitational pull will be so strong that nothing in the Universe — no particles, no antiparticles, not even light itself — can escape. 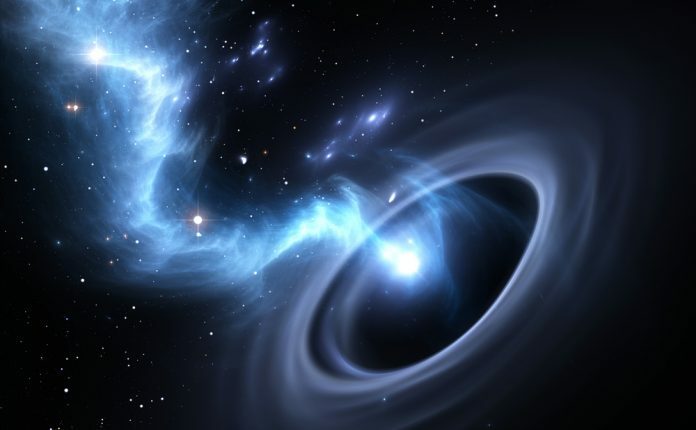 They are predicted by both Newton’s and Einstein’s theories of gravity, and astrophysicists have observed many candidate objects that are consistent with black holes and no other explanations. But we’ve never seen the event horizon before: the characteristic signature unique to black holes, of the dark region where nothing can escape. On April 10, 2019, the Event Horizon Telescope collaboration will release their first-ever image of such an event horizon. Here’s what we know right now, on the eve of this monumental discovery. Black holes are an inevitable consequence, at least in theory, of having a speed limit in your Universe. Einstein’s theory of General Relativity, which relates the fabric of spacetime to the matter and energy present within the Universe, also contains a built-in relationship between how matter and energy move through spacetime. The greater your motion through space, the lesser your motion through time, and vice versa. But there’s a constant relating that motion: the speed of light. In General Relativity, the physical size of the predicted event horizon — the size of the region from which nothing can escape — is set by the mass of the black hole and the speed of light. If the speed of light were faster-or-slower, the predicted size of the event horizon would shrink-or-grow, respectively. If light moved infinitely fast, there would be no event horizon at all. Astrophysically, black holes are surprisingly easy to create. Within our Milky Way galaxy alone, there are likely hundreds of millions of black holes. At present, we believe there are three mechanisms capable of forming them, although there may be more.